Update basic chicken pasta with garlic, flavorful sautéed mushrooms, white wine, and fresh parsley. 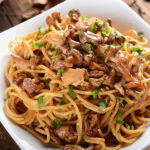 Common button mushrooms are great in this recipe, but if you want to amp up the flavor try porcini, morel, oyster, or other wild mushrooms for your chicken and mushroom pasta. This chicken pasta is loaded with mushrooms and is cooked in a delicious white wine sauce. Add a side salad or more veggies to make a great lunch. Or replace noodles with zucchini noodles for a fun dinner option.